With Heritage week in full swing, why not get out and walk a PURE mile, PURE Project manager Ian Davis explains the progress and the advantages of the PURE Project. Recent incidents of illegal dumping in county Wicklow further highlights what we’ve known for a long time now, dumping attracts dumping. It also highlights the importance of the PURE Mile as a community project, and, by working together, things can change. Over the years I have met hundreds of communities and groups, and I fully understand their anger and frustration when their locality is constantly destroyed by irresponsible illegal dumpers. I also meet numerous groups who state that, their involvement in The PURE Mile, reduced the amount, and frequency, of dumping in their area. People constantly ask, what is the PURE Mile? It’s communities and groups adopting a mile of rural road and keeping the area litter/rubbish free, organising litter picks and cleanups, researching information about built and natural heritage, and together, re-discover their locality. A good example of the benefits the PURE Mile initiative can bring to an area is, The Glenmalure PURE Mile. Glenmalure is one of the most beautiful areas in county Wicklow, attracting thousands of visitors, day-trippers, hillwalkers, tourists and campers. Unfortunately, the entire valley was plagued by constant illegal dumping and littering. The community were tired of waking up to abandoned camping sites, illegally dumped rubbish, and a littered valley floor, so all agreed that some action was needed. After our initial meeting and our discussion, The Glenmalure PURE Mile Group devised an Action Plan, An Objective. After our meeting, we organised a, Walk the Mile Day. The Glenmalure PURE Mile begins at Drumgoff bridge and meanders through a glacial valley, the longest one in Ireland, and finishes at the magnificent waterfall of Carrawaystick. As we strolled along the road, lined by mature Scots Pine trees, we highlighted areas where litter was visible, recording locations where larger items of rubbish had been dumped in the woodlands, hidden from view, only noticeable if you strayed off the road. It was obvious that my companions had great knowledge and respect for the valley, educating me on the history of The Military Road, Cullen’s Rock, The Old Mines, and the names of the numerous townlands in the area, Drumgoff, Ballyboy, Ballinafunshoge, and further on in the distance, Cullentragh Park, Ballingoneen, Conavalla, and Barravore. I have vivid memories of visiting Glenmalure when I was younger, my father telling tales of the 1798 legend, Michael Dwyer, the 16th century rebel, Fiach McHugh O’Byrne and The Battle of Glenmalure (no doubt, all tales told included embellishments to intensify the action and entertainment). After our walk, and of course, after tea, it was agreed that we would start by organising one massive, Glenmalure Valley Clean-Up. The PURE Project, assisted by Coillte staff, removed all of the larger illegally dumped items. The Clean-Up day attracted all valley residents, young and old, including people from the neighbouring townlands. They arrived armed with litter pickers, bags, gloves, full of enthusiasm and energy. The entire day was spent pulling out old litter and rubbish from the valley hedges and ditches. When all was done, and after tea and refreshments were had, the PURE Truck arrived and removed all of the gathered material. This coordinated effort resulted in the removal of over 6 tonnes of illegal dumping. Everything from pallets, tents, chairs, barbeques, bags, cans, bottles, domestic rubbish, household rubbish, car tyres, was removed from the landscape. Their next phase of the plan was to erect the various PURE Mile Signage. Then, collate information on the natural and built heritage of the area. One aspect, crucially important to the success of the project, was the monitoring of the valley for any fresh dumping. If any dumping was located, it was reported to PURE, and removed rapidly. This reduced further dumping at the site. These actions made a huge difference to the locality. Now both the people who live in the valley, and those who visit this beautiful area, are reaping the rewards. At the end of the year, The Glenmalure PURE Mile Group produced an insightful and informative self-guiding leaflet, which documents and highlights the numerous features of the valley. The PURE Mile strengthened community spirt in the area. It provided a focus. Young and old working together. A shared experience. One group member commented, ‘We are claiming back our beautiful valley and because of the PURE Mile we are more aware of what we have taken for granted for so long’. The Glenmalure Valley is rich in, natural, built, and social heritage. But it is also worth remembering, that this is a place where people live, a living valley. The people who live in Glenmalure have always welcomed both visitor and camper. All they ask is that those who visit and recreate there, do so responsibly. In 2015 The Glenmalure PURE Mile Group was awarded The Best PURE Mile. They have now extended their PURE Mile, adopting over 5 miles of road, starting at Drumgoff Bridge and finishing at Barravore. The neighbouring townlands are now also involved in the initiative, working on their own PURE Miles. The combined efforts of the community, their commitment and dedication, resulted in a massive reduction of illegal dumping in the valley. 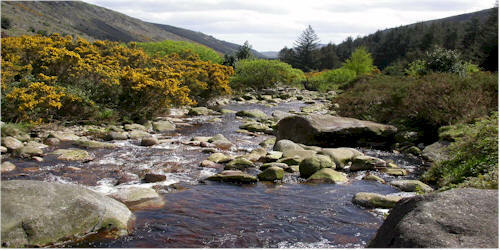 They have also assisted in the preservation and conservation of the Glenmalure Valley heritage. The PURE Mile is the perfect opportunity for communities and groups to positively contribute to their locality. It enables people to improve and enhance the place they live in, or recreate in. PURE provide all groups with PURE Mile signage, litter-pickers, bags, gloves, etc., and arrange for the PURE Truck to remove any litter/dumping collected. There are over 150 miles of road involved in the 2017 PURE Mile competition, and the concept is pure and simple, It’s Your Environment, Your Community, Your Heritage. To report illegal dumping in the Wicklow/Dublin Uplands lo-call 1850 365 121 and PURE will remove the it.